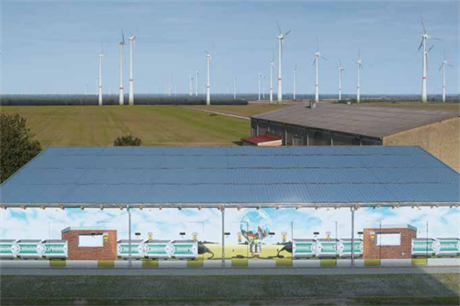 GERMANY: Wind turbine manufacturer Enercon is looking to commercialise an integrated energy storage product, following two trials at projects in Germany and the Faroe Islands. The system will use Enercon's converters and is being developed to work with various makes of lithium-ion batteries, as well as different battery chemistries. Enercon has been piloting the technology in two projects. One of these, which came online in late 2015, comprises a 2.3MW lithium-ion battery system integrated with a 12MW wind farm on Demark's Faroe Islands. French firm Saft provided the batteries. In another project, in Feldheim, Germany, Enercon's converters have been integrated with lithium-ion batteries from South Korea's LG Chem. Enercon has also built a prototype to work with sodium-sulphur — molten salt — batteries, which have high energy density. Enercon developed the software controls in-house to interface the containerised energy storage system with the electricity grid, to provide different services and functions. The company has declined to say when it hopes to commercialise its energy storage system, but is using the Faroe Islands and Feldheim pilots to gather data ahead of launching the product. Such pilots usually need to obtain data for at least 12 months to see how the storage system performs throughout an entire year. The energy storage system installed at the Husahagi wind farm on the Faroe Islands is enhancing grid stability by smoothing ramp rates and providing ancillary grid services such as frequency control. The 10MW battery system installed next to the 81MW wind farm in Feldheim is part of the village's efforts to be entirely reliant on renewable energy. The battery, which also came online in 2015, absorbs energy from the grid and is used as primary balancing power to stabilized frequency fluctuations in the control zone of network operator 50Hertz. Demand for utility-scale stationary energy storage is rising in various markets, including Europe and North America, with several companies now offering battery-agnostic energy storage systems. "The grid interface features are based on our inverters — a core technology of Enercon's — that are installed in every wind energy converter and can be relied upon to ensure the energy produced is converted to a grid-compliant voltage," said a spokesman for the company. Enercon sees lots of potential for integrating energy storage systems with fluctuating renewable energy production sources in Germany and as well as in other markets. "Our goal in the medium-term/long-term is a solid energy system based on 100% renewable power, able to guarantee power supply and grid stability without the need of fossil backup power plants. Such a system will need to consist of energy storage solutions for which we are developing the interface technology," said the spokesman.